Soc'ing Out Loud: Fearing the Devil or the Absence of God? Fearing the Devil or the Absence of God? The Devil or Satan, a personification of evil, fits well with the Muslim, Christian, and, to a lesser extent, Jewish narratives. Atheism, however, is outside of that narrative, which has made it so much more terrifying historically, and why atheists have fallen consistently near or at the bottom of most people's lists of trustworthy individuals. Here's what we can see from the GSS data on the topic. One unfortunate thing is that the GSS does not regularly ask about belief in the Devil or Hell. However, belief in Hell was consistent over the years that it has been asked so, for our purposes, let's just assume that the percentage of people who believe in the Devil and Hell have been consistent over the long term (a pretty big assumption, I know). 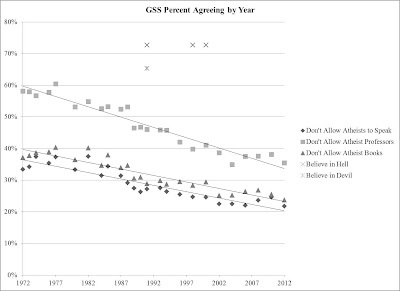 We can see clearly that over time people in the U.S. have been becoming more tolerant of atheists in terms of their freedom to speak in public, teach in colleges, and have books they've authored in libraries. This is a fairly dangerous practice, but if we follow the models, we have to go back a long time to reach those moments when attitudinal questions dropped below the belief questions, in a few cases all the way back to the late-1800s and the most recent, only to the 1970s. 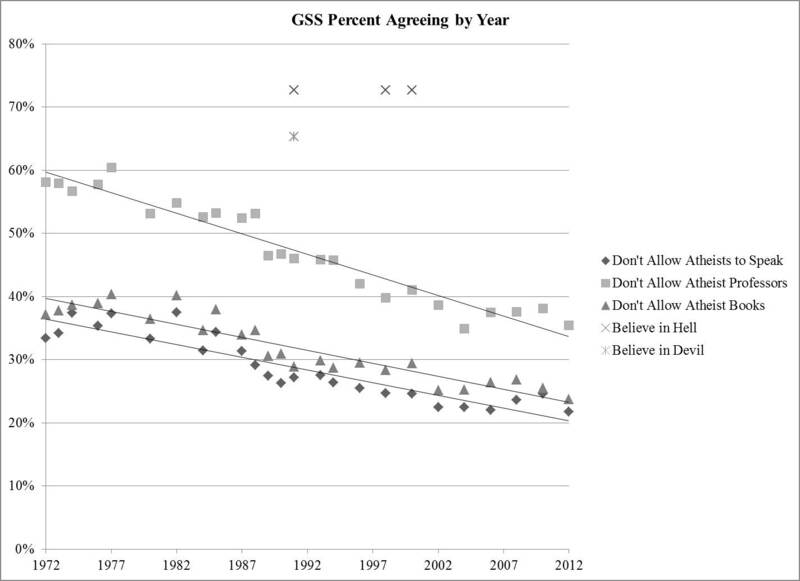 From non-systematic intuition, I would guess that people have been worrying less about the Satanic and more about the atheistic recently, but the GSS data, as shown above, suggests a different story. This of course assumes that belief in Hell or the Devil correlates well with fear of Hell or the Devil, which I think is fair. What does it mean, though, that people in the U.S. are drifting toward acceptance of the godless with sustained fear of God's nemesis? Does this signal a change in the religious narratives? Here is one theoretical stab. An important part of orthodox Christianity historically--and especially Evangelical Protestantism more recently--is voluntarism, the belief that individuals need freely to choose their faith or allegiance. Coupled with the Protestant notions of individualism (i.e. no need for priestly or institutional intercession between the individual and the divine), it is easier to see how the toleration of atheism might be increasingly seen as necessary, while belief in Hell and the Devil, though persistent, become coercive relics. To conclude, here is a recent story about fears of children and Satan worship in India. The parallel for those of us who remember the Satanic scares in the 1980s in the U.S. are stark.